Home Income Tax INCOME TAX RETURNS: Special Return Counters For Salaried Tax Payers (Including Pensioners) Between 24th to 31st August, 2015. 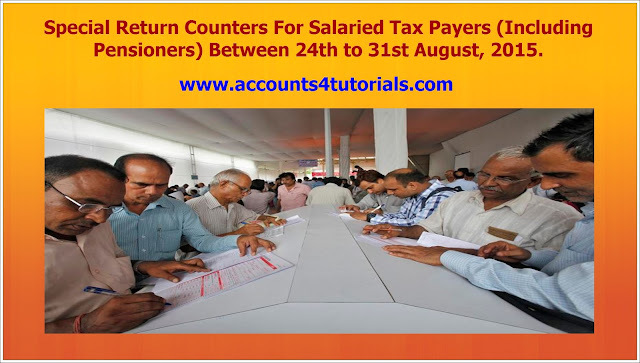 INCOME TAX RETURNS: Special Return Counters For Salaried Tax Payers (Including Pensioners) Between 24th to 31st August, 2015. The Pr. Chief Commissioners of Income Tax, New Delhi will be organizing special return counters for salaried tax payers (including pensioners) between 24 to 31 August, 2015 at Pratyaksha Kar Bhawan, Civic Centre, Minto Road, New Delhi. The camp will be inaugurated by Chairperson of the Central Board of Direct Taxes, Smt. Anita Kapur on 24 August 2015 at 10.00 am. For PCIT-22 Charge (Government salary)-‘B’ Block, Ground floor of Civic Centre, Minto Road, New Delhi. For PCIT-23 Charge(PSUs/Bank employees/School and College employees)-‘C’ Block, Ground floor, Civic Centre, Minto Road, New Delhi. For PCIT-24 Charge (Private salaries)- ‘C’ block, Civic Centre, Minto Road, New Delhi. Similar facilitation counters are being set up in other metropolitan cities based on the local requirement.